Four strategies to help you reflect on your communication skills as a way to build a stronger school community. Community-building activities ​are a hallmark of the beginning of the school yea​r—in both classrooms and professional development—but they peter out by ​late fall. These activities matter, as they provide us with ways to grow in groups and individually. 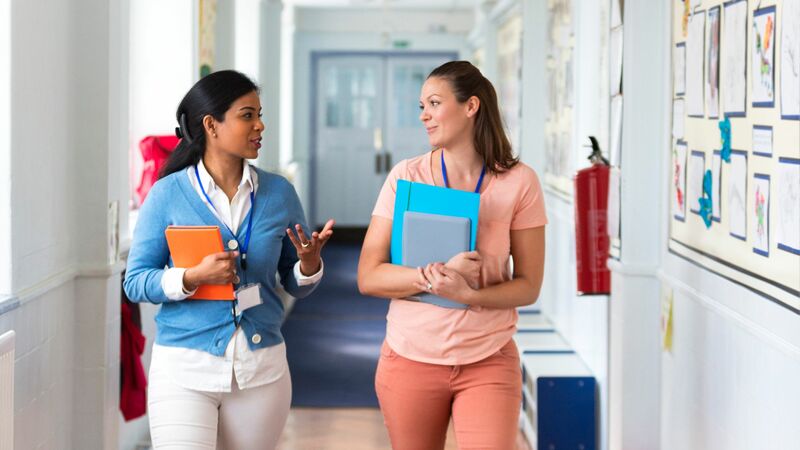 Here are four suggestions for how you can continue to develop your ​interpersonal ​communication​ skills​ as well as build a community with your colleagues and your students. These are all within your sphere of influence and are actions you can start taking right now. 1. Listen with an expansive mind: Where does your mind go when you’re listening? Sometimes, perhaps, you’re closely attending to what a speaker is saying, keeping your heart open. Other times, your mind may wander to a place of judgment or impatience, or maybe you want to jump in and offer solutions and advice. Listening lies at the center of healthy social relationships. Listening expansively means listening with hope, curiosity, and compassion. It means listening for opportunities to deepen and strengthen relationships with an irate parent, a disrespectful student, or a contentious colleague. When we listen expansively, we are poised to build strong community. I’ve developed an activity to guide you in practicing this technique.​ Consider ways you might put this to use in your professional development spaces and faculty meetings. Also, invite your students to listen with an expansive mind, sharing strategies they can try. 2. Pay attention to body language: Nonverbal communication may say more than the words that emerge from our mouths. Often, the messages we seek to communicate are delivered in our pitch, tone, volume, pace, and body language. To build community, we need to examine our own nonverbal expressions and consider how we interpret those of others. When we talk with someone and perceive a mismatch between his selection of words and his nonverbal communication, our trust in him diminishes. When our own body language doesn’t match what we’re saying, others won’t trust us as much. If we can’t read a person’s nonverbal communication, we feel uncomfortable around her. When we misinterpret someone else’s body language, we can miss an opportunity for connection or can even take actions that have a negative impact on the other. As you communicate with others—students, colleagues, parents—start focusing your attention on your own nonverbal cues. How do you communicate kindness? Curiosity? Compassion? How do you interpret the nonverbal communication of others? Does your interpretation cause you to become more curious and compassionate, or to shut down and create distance with the other person? You can build community by simply heightening your awareness of your body language and how you interpret the body language of others. 3. Expand your cultural competence: Cultural competence is the ability to understand, appreciate, and interact with people from cultures or belief systems different from one’s own. It is the ability to navigate cross-cultural differences in order to do something—be that teach students, collaborate with colleagues, or socialize with friends. The differences can be generational, racial, gendered, national/regional, and so on. Cultural competence helps to build strong communities. Are aware of their cultural identity, beliefs about difference, and unconscious biases. Have knowledge about the general role that culture plays in people’s lives as well as knowledge about specific other cultures. Effectively navigate difference—self-awareness and knowledge don’t automatically translate into the ability to act. Regardless of our race or ethnicity, gender, or socioeconomic background, we all need to cultivate cultural competence if we truly want to create healthy schools and classroom communities. 4. Address conflict: Conflict can either strengthen or undermine a community, but most of us are conflict-averse and lack skills to deal with it. While there’s so much we need to learn about how to manage conflict and engage in productive conflict, let’s look closely at gossip, whether among students, parents, or staff. Gossip is a barometer of the overall interpersonal health of a community, and it can quickly spread if not addressed. I suspect that many of us have witnessed the destructive impact of gossip in our workplaces. If you have an issue or complaint about someone, take it directly to that person, get some coaching or feedback about how to resolve the issue, or let it go. One effective strategy I’ve seen in schools is the creation of gossip-free zones, in which people commit to speaking positively about others. In a gossip-free zone, if someone slips up, you kindly remind them of the agreement. I’ve seen this approach work wonders for kids, parents, and staff—once they’ve recognized how destructive gossip is and committed to stopping it. Hopefully these four strategies have helped you reflect on your interpersonal skills as well as your contributions to your school community. Strong communication and a healthy community can bolster us through challenging moments, bring joy to our lives, and improve our resilience.